‘Over the Edge’ is Europe’s highest swing on our sky deck. Daredevils and thrill seekers will swing 100 meters above the ground. The swing is part of the A’dam Lookout experience. Back and forth over the edge of the tower with Amsterdam below your feet. Enjoy the unrivalled view over our capital city, while the adrenaline flows through your body. Going to a festival is a favorite getaway of Amsterdammers. The Amsterdam festivals attract many visitors from home and abroad. The Parade travelling theatre festival returns every summer to tour the Netherlands with a rich array of artistic surprises in tow. 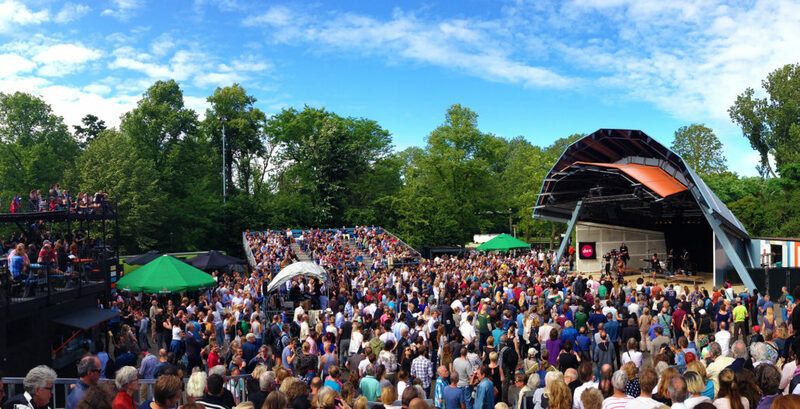 The festival rolls into Amsterdam’s Martin Luther Kingpark in August. Besides providing a stunning backdrop to the city’s historic centre, Amsterdam’s canals offer one of the most memorable ways to discover the city. Whether you’re a first-time or frequent visitor, everything in Amsterdam seems that little bit more magical when viewed from a boat. Pioneers are giving shape to NDSM. A place where ship workers, artists, media makers, performers and young entrepreneurs are each making their unique mark. There are about 30 parks in Amsterdam, ranging from Wertheimpark which covers one hectare, to the fabulous Vondelpark which covers 48 hectares. The number of parks makes Amsterdam a peaceful oasis even on a busy day. Amsterdam has many public indoor- and outdoor swimming pools, officially approved natural spots, and a good number of ‘wild swimming’ locations, perfect for picnics along with a refreshing dive or swim. When it’s warm outside, a lot of people enjoy swimming in ponds, lakes and rivers. The best place to go swimming is in the designated swimming spots where people can swim in safe and clean water. For many years now, free Lunchtime Concerts have been held in the Main Hall and the Recital Hall. Usually, these Lunchtime Concerts take place on Wednesdays, but please check the concert schedule as occasionally this changes. The concerts range from public rehearsals by the Royal Concertgebouw Orchestra, to chamber music performances by young up-and-coming artists.